Skinny Pelembe - Sleep More, Make More Friends. Vinyl EP. Bleep. 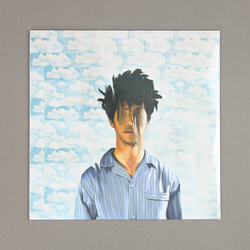 The rising producer and multi-instrumentalist associated with Gilles Peterson’s Brownswood Recordings, Skinny Pelembe, follows on from his ‘Spit/Swallow’ release with ‘Sleep More, Make More Friends’. Featuring a collection of musicians met through the Future Bubblers programme, Pelembe’s latest EP weaves together a concoction of Afro-tipped genres. 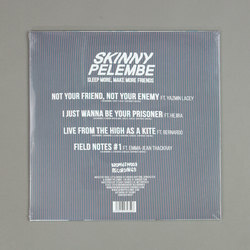 From Yazmin Lacey’s soothing vocals on intro track ‘Not Your Friend, Not Your Enemy’ to the juxtaposing ragga vibes and doo-wop conclusion of ‘Live From the High as a Kite’ Pelembe’s ability to converse in a multitude of genres conveys both his relevance as a producer and unique understanding of society’s musical roots.